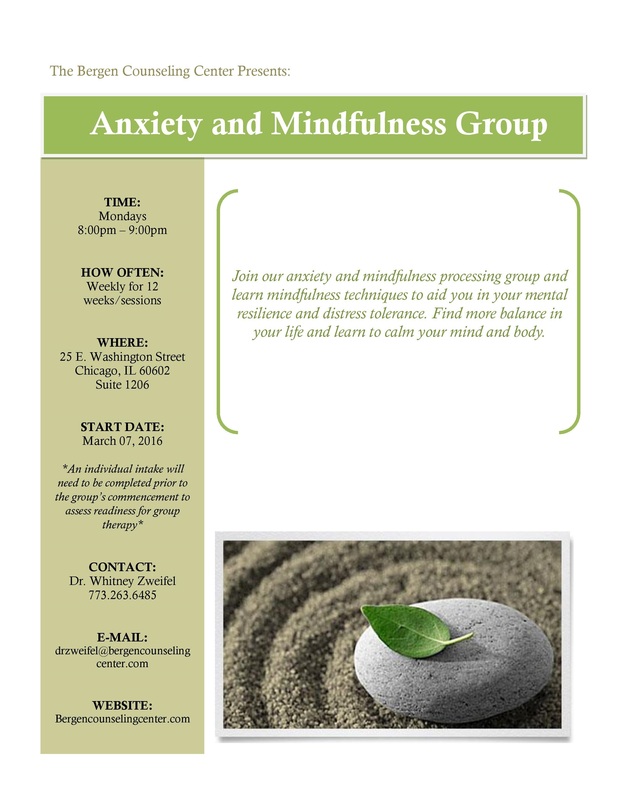 New Mindfulness for Anxiety Group! The Bergen Counseling Center is excited to announce a new group on Mindfulness and Anxiety. The co-ed group starts on March 7th and will be led by Dr. Whitney Zweifel. We welcome you to contact Dr. Zweifel with any questions or to schedule a introductory consultation about becoming a group member. A downloadable PDF flyer with more information is available at the bottom of the post. Do you have difficulties calming your mind? Do you experience stress and anxiety? Join our anxiety and mindfulness processing group and learn mindfulness techniques to aid you in your mental resilience and distress tolerance. Find more balance in your life and learn to calm your mind and body.